In my post “Careers in the Luxury Yachting Industry: What Can Yacht Stewardesses Do in the Future?“, I presented over a dozen land-based career options that exist both within the yachting industry and even outside of it. The occupations listed represent career paths that any seasoned yacht stew is perfectly suited for once he/she decides to hang up the ol’ feather duster. 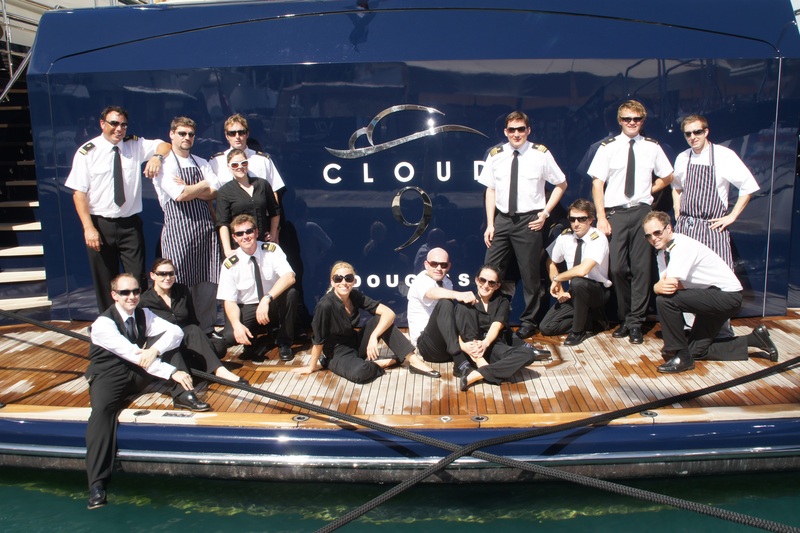 Former crew on M/Y “Cloud 9.” Photo credit: Suki Finnerty of YachtingToday.TV. While my previous post gives you some ideas on how to respond to the “Negative Nellies” in your life who try to talk you out of pursuing a crew job on superyachts, I know from experience that it might take more ammunition than just jobs you say you’ll be able do. What you want to tell these pessimists about are the SKILLS that you will gain as a yacht crewmember. I worried about what I would do “after” yachting. I’ll admit it: I worried how taking time out to travel the world as a yacht stewardess would affect my future job prospects. I had two college degrees under my belt, and they carried a lot with them; namely, the pressure of having to get “a real job” in some corporate setting at some stage in my adult life. I’ve now grown to understand that the “have to” part of that sentiment is just one big myth, and that there is no direct correlation between holding what others deem a prestigious job—and happiness. And still, while I worked as a stewardess, I often wondered, despite the great money I was earning and how much I loved my job, if I might be harming any potential for a serious corporate career down the road. I later discovered that, in fact, the opposite was true. Soon after leaving my career as a yacht stewardess, I sent my résumé out to companies in marketing, advertising, and media sales. Immediately, people were calling me to set up interviews. At the time, I attributed this to my academic accomplishments and all of the professional internships I’d held in college. When I got into these offices for face-to-face Q&A, all my interviewers wanted to hear about was the time I’d spent on yachts: “So, tell me more about this yachting thing you did…like, who was it traveling onboard?” (That’s where I’d fantasize saying, “Well, I could tell you, but I’d have to kill you.”) And in rattling off the types of people I served (keeping names confidential, since it could have been a test of my integrity) and everywhere I’d traveled, I made some of these no-nonsense executives’ jaws drop on the floor. Managed the interior of this “five-star hotel on water,” hosting $25,000-per-day charters for celebrities and dignitaries. Responsibilities included, but were not limited to, guest and crew provisioning, taking full accountability for interior cleanliness, meal presentation (silver service), stock management and budgeting (developed an inventory-control system), theme-night planning and decorating, arranging guest excursions ashore, assisting in docking maneuvers, and supervising two other stewardesses. Trained in sea survival, fire-fighting, basic first aid, and onboard-safety procedures. In addition to the above, I also served as the captain’s office assistant (purser) when needed. Responsibilities included accounting, communications, ordering, and broker relations. If you were looking to hire someone in a customer-relations or a sales position, ask yourself if you’d be interested in a job candidate who was “detail-oriented,” “results-driven,” and a “multi-tasker,” accustomed to dealing and communicating with all types of people, and experienced at completing even the most difficult of challenges (a.k.a. “a problem-solver”). Throw in the “team player” and the “trained in high standards of etiquette and well-traveled” parts, and you have a pretty impressive applicant for most jobs—corporate or otherwise. And that’s exactly what crewing on a yacht can make you! As a matter of fact, I have since worked in sales & marketing jobs at an executive level for a number of companies, from tech start-ups to a full-scale digital marketing agency. And I’ll tell you right now that not a day would go by in any of these jobs when I wouldn’t call upon one of the finely tuned skills I gained serving as a yacht stewardess on the high seas. So go for it! The future is bright, indeed. Learn more about getting started with a career in the luxury yachting industry by downloading Chapter 1 here. Or buy it now on Amazon.